Sri Lanka's apparel manufacturers see export demand holding up this year despite concerns about a slowing European economy, thanks to a focus on ethical manufacturing, factory investment, and the arrival of new international buyers. Dilshami Samaraweera spoke with firms showcasing their products at the recent Sri Lanka Expo 2012. Sri Lanka's top apparel manufacturers were among firms showcasing their products at Sri Lanka's biggest post-war trade event, Expo 2012, last week in Colombo. Organised by the country's Export Development Board, the Expo was aimed at raising international awareness of Sri Lanka's post-war export industries - and, of course, to attract export orders. President Mahinda Rajapaksa, who officially opened the event, said the large foreign investor presence was a vote of confidence in Sri Lanka. The government also hosted the US-Sri Lanka Trade and Investment Framework Agreement (TIFA) talks in parallel with the exhibition, which allowed exporters to show their products to a top level US trade delegation. Apparel - Sri Lanka's biggest export product - not surprisingly made a strong showing. Clothing and textiles accounted for 52% of total industrial exports from Sri Lanka last year in value terms and accounted for about 40% of the volume of total products exported. The industry expects a good year in 2012 with most companies reporting full order books for the next few months. Brandix, Sri Lanka's biggest apparel exporter said export demand is expected to hold up despite concerns about a slowing European economy. "The first quarter of 2012 has been better than last year for a number of reasons," Mr M Raghuraman, the chief executive of Brandix Market Watch, told just style. "Mainly it's because China is becoming more expensive and Vietnam is getting over-heated with manufacturers moving from China into Vietnam. So the overflow has been coming into Sri Lanka." Although export data is only available for January this year, export incomes for textiles and garments have shown a 1.6% growth compared to January 2011. Last year, apparel and textile exports grew by 24% with export incomes of US$4.2bn. Brandix says at least some of the growth can be attributed to ethical manufacturing standards in Sri Lankan apparel factories. Although ethical positioning through the 'Garments Without Guilt' campaign, has not brought in higher margins for made-in-Sri Lanka garments, it has pulled in more orders. 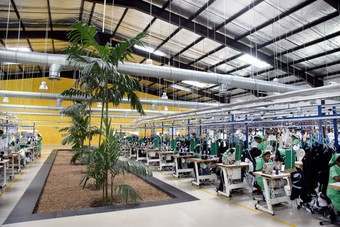 It has also allowed Sri Lankan garment factories to differentiate themselves in international markets. "There are lower cost destinations like Bangladesh, but they have an ethical question mark hanging over them," said Mr Raghuraman. "Now, with more consumer awareness, compliance matters. It's not like before. Buyers are now getting into ethical sourcing. That's where we have been able to do better. They are not paying us more for ethical products but they are giving us more orders." The end of war has also helped the apparel industry. With travel warnings letting up after the end of a 25-year civil war in May 2009, new international apparel brands are now placing orders with Sri Lankan factories. "Since the end of the war we have seen some new brands coming to Sri Lanka. Previously there were restrictions, like travel warnings. But now anyone can come to Sri Lanka. It has also become easier for our long term customers as well, and they have also increased their outputs from Sri Lanka because there are no security issues now," said Mr Raghuraman. Brandix says its order books are full until July and is not expecting a downturn for the rest of the year. Sarasavi Exports, a manufacturer of tights, socks and ties made from wool and cotton, which are exported to the US, UK, Germany and Scandinavian countries, said 2012 has been better financially than 2011. "We have done well because we have invested in new systems and technologies at our factory to cut costs and offer more value," said Mr MDS Hemantha Kumara, the chairman and managing director. More customers are now demanding value additions like anti-bacterial socks and perfumed socks, the company added. Daya Apparel, another large exporter, hopes to attract new buyers for its multi-purpose clothing that is water and dust resistant. "Many buyers don't know this type of thing is available. All this time only one international brand was buying these items from us. But we showed these items to other buyers who came to the exhibition and they were very interested, because these garments are very versatile," said merchandising director Ranjith Fernando. Daya Apparel says its order books are full until August and is hopeful of growth during the rest of the year.